Illini Media has been at the heart of communications on the University of Illinois campus for over a century. Our successful, award-winning, student-run organization has served as an unparalleled training ground for students interested in all aspects of media operations. Countless numbers of professional writers, editors, photographers, artists, on-air talent and salespeople began their careers here, gaining practice expertise that complemented their academic experiences at the University. Illini Media’s mission is to provide a unique experiential learning environment to complement University of Illinois at Urbana-Champaign’s academic areas; to prepare UIUC students for future careers in print and digital media, broadcast, marketing, public relations, sales, fundraising and business; and to inform, enlighten and entertain the UIUC student community. Our calling for the future is to allow our students to keep pace with rapidly changing technologies, while retaining a focus on the production of excellent work. We can meet that challenge if we continue to provide the facilities and resources that allow our students to move forward, building on the renowned reputation and legacy of former Illini Media students. Our location and equipment sets the stage for exciting progress; sending our students to media conferences and fostering relationships with professionals in their fields will also be critical in meeting our educational mission. The Illini Media board and management believe that the investment in these resources will be invaluable as our students continue to succeed here and in their future careers. Students working at Illini Media have a hand in every facet of producing media: reporting, photography, editing, designing, broadcasting, sales, marketing, and management. By offering comprehensive training, providing state-of-the-art tools and resources, and creating a challenging, fast-paced environment, we create highly marketable employees. Professional and student media outlets throughout our nation are struggling to reinvent themselves under considerable financial pressures. Our main challenge is to build more responsive digital products and monetize them, while still clinging to diminishing print revenues. Our students work here for the same reasons you did—they love it, they know they will make life-long friendships and gain valuable networking opportunities, and they know that Illini Media offers the experiential learning component that will enhance their lifelong career. It is a difficult burden for our students to shoulder the company’s operating expenses. Illini Media’s goal is to meet the financial obligations while maintaining excellent resources and opportunities for our current students. Reach over a million users a year! Click here for a look into how our users are viewing us. Students are more likely to be reading their college newspaper than their local paper and college ages 18-24 make up 96% of visitors on DailyIllini.com. C-U’s source for local, state, and world news is published online every day and on newsstands Mondays and Thursdays. Champaign-Urbana looks to The Daily Illini as its source for Fighting Illini sports coverage, campus information, spirited commentary, and local, state and world news. 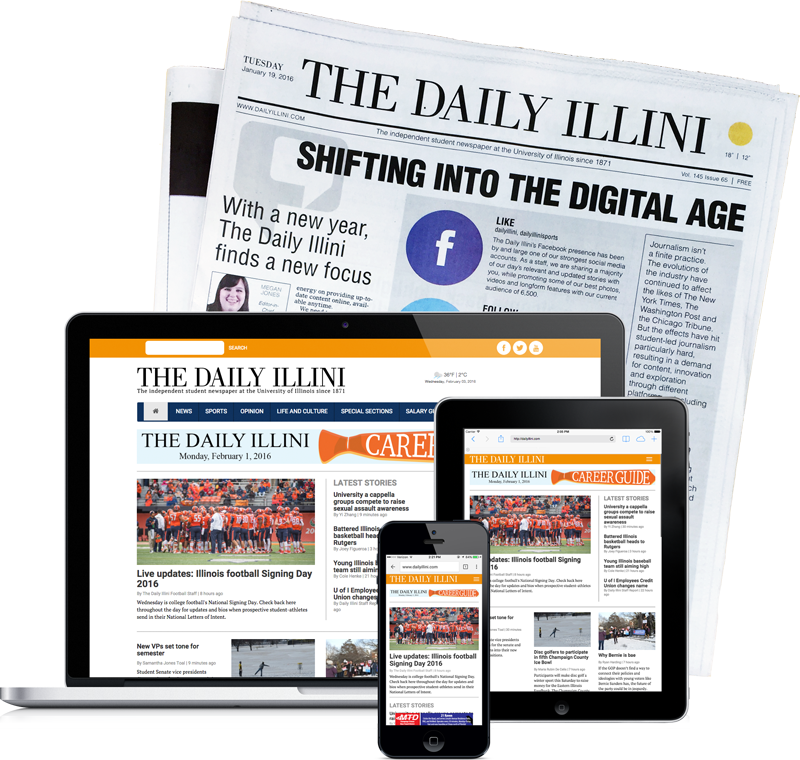 Monday and Thursday mornings, 8,000 copies of The Daily Illini are available free-of-charge at over 150 distribution points throughout the community. The Daily Illini is respected as one of the leading college newspapers in the country, regularly garnering national recognition and awards. Online entertainment magazine helping readers know what to do in Champaign-Urbana. 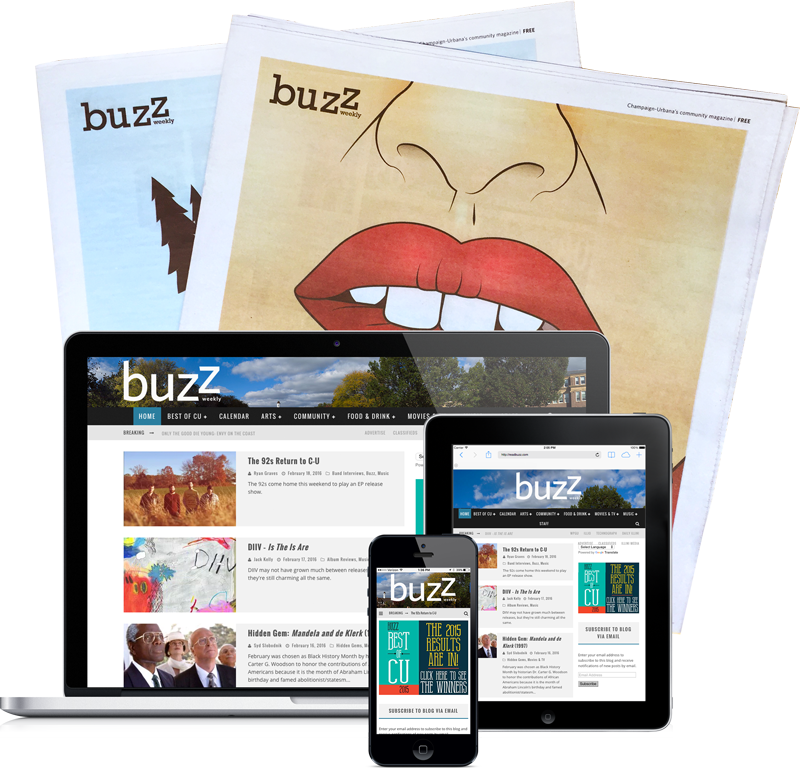 Buzz is C-U’s premier arts and entertainment website and offers unique student views on film, music, theater and leisure time, as well as a comprehensive events calendar. Buzz has been instrumental in forging exciting connections with the arts scene on campus and in town. Look for Buzz’s annual “Best of CU” edition in print every November. 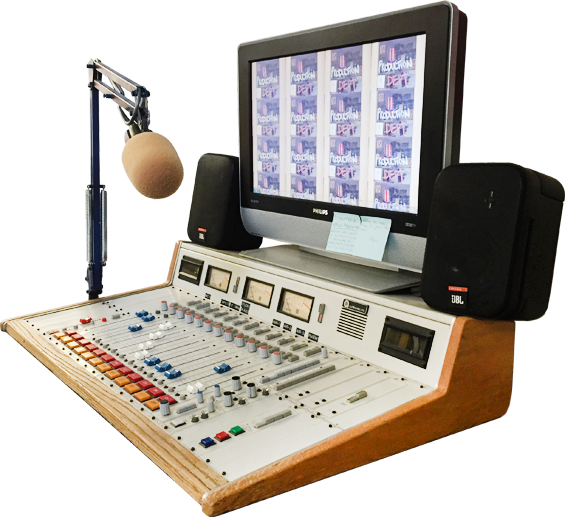 Alternative radio station on air 24/7 with lively student personalities, alternative music, specialty programming, and local news. Our student-run commercial station broadcasts live 24/7 with a 3,000 watt signal, reaching 20+ miles outside Champaign-Urbana. Lively on-air personalities, alternative music, specialty programming, and local news and ports reports characterize the sound of the station. 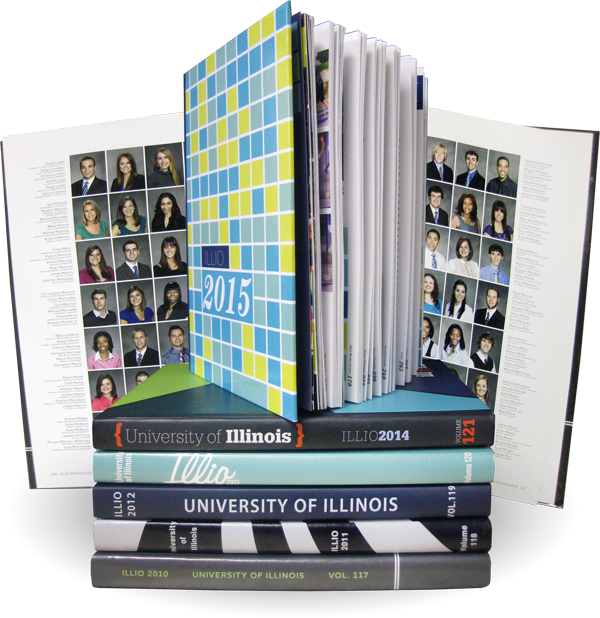 Yearbook preserving campus life, history, and memories for thousands of students at the U of I since 1894. Each year since 1894, Illio editors have recorded campus life and University history from student perspectives. The Illio is an impressive publication of more that 300 pages, featuring photos, designs and articles that preserve campus memories for thousands of students. Engineering magazine published quarterly and covers the cutting edge of science and technology at the University. 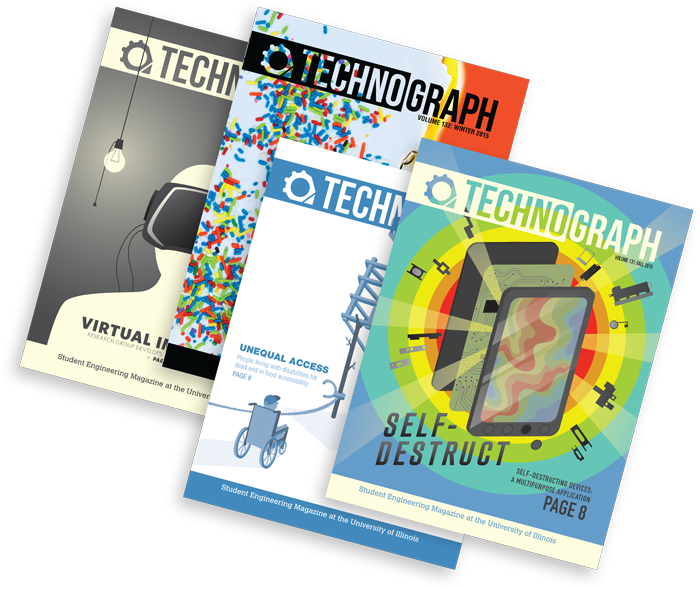 Since 1885, the student-produced Technograph has covered the cutting edge of science and technology at the University. The magazine is published quarterly and distributes free of charge on campus.